Girl 17yrs old........future husband 112! 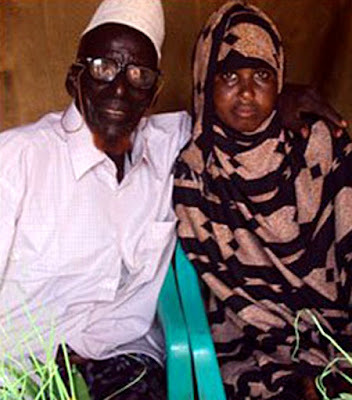 Hundreds of people attended the wedding man in the 112-year-old named Ahmed Mohammed Dor, the girl net Abdullah aged 17 years in Somalia . And the role of 18 children of 5 wives and expressed a desire to have more children from his new wife. The role after the wedding ceremony which was held in the region of central Somalia Galgudud "Today, God helped me to achieve my dream ". The family of the girl that her daughter happy with her new husband . He pointed to the role of the girl from his village have waited until you grow up to apply for her hand, saying, "I did not force her, but use my expertise to my love and then we persuaded her to marry ". The BBC said that in Somalia historians consider this the first marriage of its kind in the Horn of Africa for more than a century .